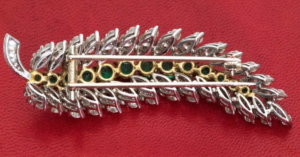 Recently we had the pleasure of selling a rare vintage, custom designed Cartier Jewelry Brooch, We were sad to see it leave and thrilled to see it go to a new home. The bracelet was originally purchased in our New York City office about 2 years ago. We had photographed it many times and featured it in many marketing placements. One of the greatest things about this custom piece is that the original receipt, as well as the sketch design of the piece, was present for further provenance. Originally this magnificent pin sold for $3,670 in the 1960s. 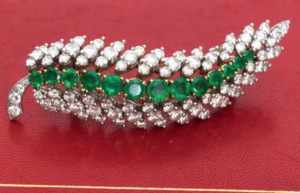 This brooch fetched a number greater than 10 times the original amount paid in a recent sale! At Verma Group we love to purchase and collect items like this. The original owner had sold it to a local jeweler in New York who then reached out to our offices knowing we would have a strong interest in acquiring it. The luxury goods firm Cartier began as a jeweler and continues to craft some of the world’s most coveted watches and jewelry. Now known as Société Cartier, the firm founded by Louis- Louis-François Cartier in 1847 continues to headquarter in Paris, France, the location at which it was founded. It continued to run as a family business until 1964 when the family sold it the Swiss firm Compagnie Financière Richemont SA. The wristwatch brand now worn by royalty had humbler beginnings. Louis Cartier’s close friend Alberto Santos-Dumont, the pioneering Brazilian aviator, complained to him that pocket watches proved impractical and unreliable while in flight. Cartier designed a flat, square bezel wristwatch. He dubbed it the “Santos” and the design continues in popularity. For more than a century royalty has chosen to wear Cartier. King Edward VII of England ordered 27 tiaras for his 1902 coronation. Two years later, he issued a royal warrant to the jeweler he referred to as “the jeweler of kings and the king of jewelers.” Cartier has designed pieces for the royal courts of Albania, Belgium, Egypt, Greece, House of Orleans, Portugal, Romania, Russia, Serbia, Siam, Spain. Louis-François Cartier passed the company to his son Alfred who then passed it along to his sons Louis, Pierre and Jacques. The trio took the company from popularity in Western Europe to worldwide brand. Louis’ original designs such as the “Tutti Frutti” jewels became lastingly famed. He’s also known for the brand’s mystery clocks and Art Deco designs. On the interior, his watches contained movements by Edmond Jaeger with whom he contracted in 1907. Three models of his early 1900s wristwatches continue in production today: the Baignoire and Tortue which debuted in 1912 and the Tank which debuted in 1917. Cartier crafts jewelry as well. It has created some of the best-known designs and many of its pieces now reside in museums. For example, the U.S. National Museum of Natural History displays the Bismarck sapphire necklace crafted in 1935. According to Watch Time, Cartier, Rolex and Patek Phillipe rank among the top brands for investment. Although many may think first of stocks or bonds as an investment, jewelry provides an ideal investment opportunity because it, like a home, can provide many years of enjoyment while its value increases when cared for properly. While not all jewelry increases in value, you can visit an Atlanta jewelry buyer and appraiser like Verma Jewelry to obtain an appraised value for the piece. Also a Cartier jewelry buyer, Verma regularly values, purchases and sells Cartier jewelry. This also makes it an ideal Atlanta location to shop for Cartier jewelry. 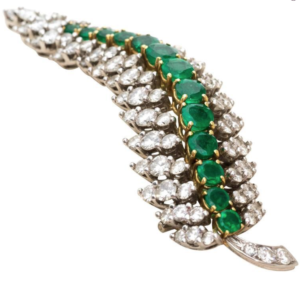 Cartier holds a rare record in investment jewelry. 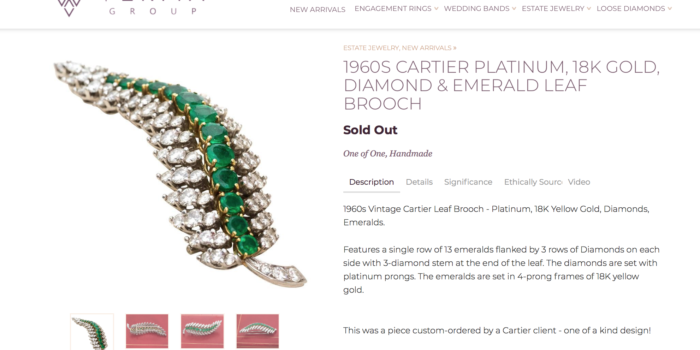 No estate Cartier piece has sold at auction for less than its original purchase price. That means no investor loses money. Many of its pieces increase in value. According to True Facet, the Cartier Love Bracelet debuted in 1970 for $250. Today, the Love Bracelet costs $6,600. 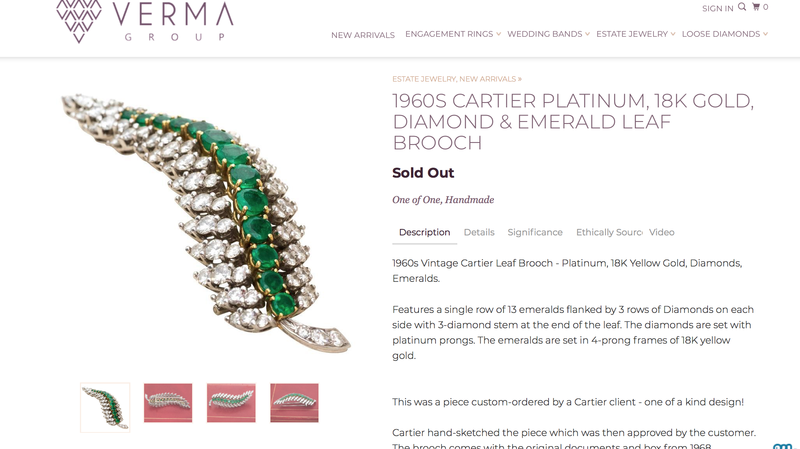 Verma provides one of the few Atlanta places to sell Cartier jewelry. Individuals who recently inherited jewelry or who want to appraise their own jewelry can visit to obtain a value on their Cartier pieces. The value of a piece is determined not only by the designer and it’s unique design but is also influenced by the materials used. Commercials for the security of gold don’t just refer to gold bars or bullion. Gold jewelry also increases in value. While trendy precious stones and metals may fluctuate in value, gold does not widely fluctuate. It’s value steadily increases over time. For instance, an ounce of gold purchased in 1975 for $79 is now worth $1,153. That’s a 176 percent increase, adjusted for inflation. For the best investment value, choose items of at least 18 karats. Appraisals are valid at the time issued but the value may change. It can increase or decrease. When getting ready to sell a piece of jewelry, choose the appropriate timing. Check the market to determine the current price. If it’s lower than you’d like, try to hold the piece until you can obtain the best value for it. A word of warning: Vintage Cartier gets rarer by the day. Both Cartier and Boucheron purchase back their vintage pieces to ensure the brand’s jewelry retains its value. There’s no glutting the market with Cartier. It exhibits its vintage designs for public enjoyment. That creates a boon for individuals who own a Cartier piece and those with the brand’s signature stamp or numbered issue draw an even higher price. Visit Atlanta jewelry buyer Verma to shop for Cartier or sell it. We can also help with appraisals and jewelry investment advice.